Taka Kigawa on Monday at Le Poisson Rouge, where he played works by Elliott Carter, Sean Shepherd, and John Zorn. It’s hard to put your finger on just what it is that makes the pianist Taka Kigawa a phenomenon, but there’s no denying that he’s something special. True, other pianists have made a specialty of the demanding modernist works that Mr. Kigawa favors. Webern, Boulez, Xenakis and Stockhausen are among his staples. (Bach, too.) And in his considerable technical prowess, Mr. Kigawa is not without peers. Still, something about his work has attracted a veritable cadre of devoted followers. 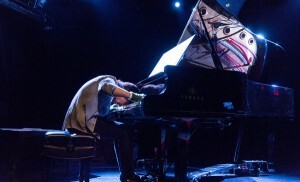 On Monday night, they turned up in force at the Greenwich Village nightclub Le Poisson Rouge, where he has become a regular, for a characteristically challenging, eventful program built around two milestone pieces by Elliott Carter. Having watched Mr. Kigawa at work several times, I have grown convinced that part of what makes him a magnetic attraction is awe: not only in the sense that his skill dazzles the listener, but also in his own evident humility and zeal. Some listeners will intuit more fully than others the exact challenges of this or that work. But anyone can appreciate how the wonder and joy Mr. Kigawa conveys in talking about his repertory during a concert is also manifest in the way he performs it. That said, you can differ with interpretive details. Mr. Kigawa brought all the precision and finesse you could want to John Zorn’s “Carny,” a Frankenstein’s monster of fleeting quotations, distortions and allusions, bolted together in the manner and spirit of a vintage Looney Tunes soundtrack. Moody murmurings shift without warning into booming avalanches or cocktail-bar vamping. Wagner’s “Tristan” chord materializes abruptly, like the Mona Lisa spotted on a video-arcade wall. Here, every detail was in place, but what I missed was a frisson of impudence; Mr. Kigawa seemed too polite to indulge Mr. Zorn’s rude vitality. From there, the interpretations grew more penetrating. Carter’s Piano Sonata, from 1946, is among the stronger expressions of an early Neo-Classical phase, its lucid architecture reinforced with Romantic ardor and brilliant color. Mr. Kigawa did full justice to those attributes. Positioned between Carter’s twin peaks, Sean Shepherd’s three “Preludes” made a striking impression with their economy and individualistic language. In two ghostly outer movements and one prickly, briefly cheeky centerpiece, Mr. Shepherd neatly and poetically explores the piano’s aural resources. Mr. Kigawa was a diligent, compelling advocate. “Night Fantasies,” which concluded the recital, was the evening’s clear triumph. A ceaseless roil of shadowy impressions fleeting and half-sensed, the piece is one of Carter’s grandest, most poetic achievements. With subtlety and finesse, Mr. Kigawa produced a haunting palette of crepuscular shades while providing a sensation of flowing continuity across the work’s full span.